Shouldn’t the central star represent Polaris, and the line coming out Auriga (the grain harvest)? Context clues include the stars of Taurus lined up to the west of Polaris in an accurate angle and Tashter lined up as you would see it if observing them from Polaris as your focal point. This would also explain why stars 56 and 57 are ‘a straight line’ to point to the central star as they would be Dubhe and Merak (the edge of the big dipper). The reason those two stars are considered so important is they showed, with great symmetry, the four seasons. It seems, again, in this orientation to be tracking winter? This would also explain why there are so few stars in the reciprocal part of the sky (only 58, 59, 60) and why the constellation Taurus is depicted on the left hand side of the page despite being a feature of the southern sky. This probably isn’t the place to explain why – it would take far too much space – but your note about Sara Kuehn’s paper, where she mentions that “the Persian gochihr, [is] called “al-jawzahar” solves a small puzzle about a French copy of Gregory’s Moralia in Job which has niggled at me for years. Thanks so much! For general information, the post in which I initially proposed Ceuta as the site included in the west roundel on folio 68v has now been reposted at Voynich imagery. Some readers might find a comparison between the ways in which the original map, and the later European one, represent such a site. An interesting post by Peter James Clark suggests that f68r3 could be a horoscope in the Hellenistic “octotopos” (or “oktotropos”) form. He also notices that the four quadrants of the diagram are “numbered” clockwise by an increasing number of stars (from 1, top left, to 4, bottom left). Apparently, the 8 houses of the oktotropos were numbered clockwise, while the common 12 houses are numbered counterclockwise. The Greater Bundahishn (GB) includes a Zoroastrian Horoscope of the World (section 5A). The “creation” is triggered by a conflict in which Good, represented by the Sun, the Moon and the fixed stars, fight Evil, represented by the five planets and the dragon of eclipse. The following is a translation by Mac Kenzie (from his excellent paper Zoroastrian Astrology in the Bundahisn). 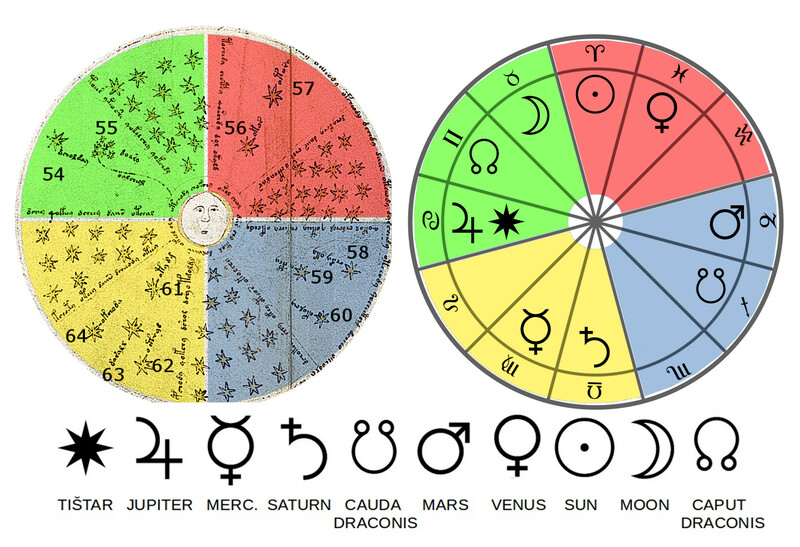 I added the numbers of the astrological houses. House 1 corresponds to the East, House 4 to the North (below the horizon), House 7 to the West, House 10 to the South (Medium Coeli, the highest point of the ecliptic above the horizon). [51.1] He [Ohrmazd] says in the Religion that at noon on the day Ohrmazd of the month Fravardin [the first day of the first month], when day and night were equal, the aggressor rushed in. [51.3] [The ascendant, or cusp of the house of] Life [house 1] was 19 degrees of the Crab, in the lunar mansion Azarag; in it was the star Sirius; of the planets Jupiter was in it; (the house of) the Purse [house 2] was the Lion and Brothers [house 3] the Ear of Corn ; Homes [house 4] the Balance—Saturn was in it; Offspring [house 5] the Scorpion and the Sick [house 6] the Centaur – the Dragon’s Tail was in it; Marriage [house 7] the Goat – Mars was in it; Death [house 8] the Pail; Travelers [house 9] the Fish—Venus was in it; he Middle of the sky [house 10] the Lamb – the sun was in it, in the lunar mansion ; Good Fortune [house 11] the Ox—the moon was in it; Bad Fortune [house 12] the Two Images the Dragon’s Head was in it. A transcription of the Avestan original text is available in this (Italian) book by Hasan Taqizadeh (p.131). 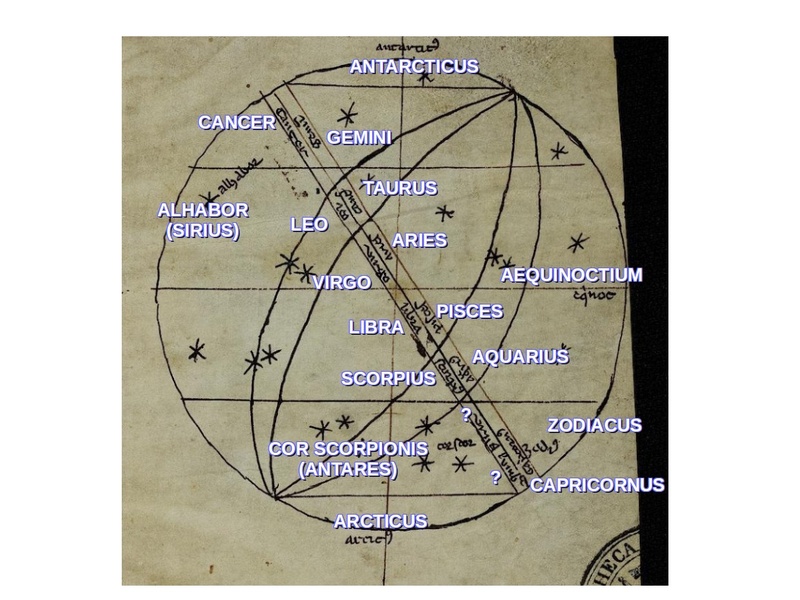 The Bundahishn includes a diagram for this horoscope. It is translated in Mac Kenzie’s paper and in this post by K. E. Eduljee. The diagram follows the Persian and Arabic tradition of showing East (the “ascendant”) at the top, South (Medium Coeli) at the right and so on. 1) The Voynich diagram follows the Western tradition of showing the Ascendant at the left and Medium Coeli at the top (so the Bundahishn horoscope must be rotated 90 degrees counterclockwise). This is the same orientation that we discussed when comparing the diagram with the Mansions of the Moon. 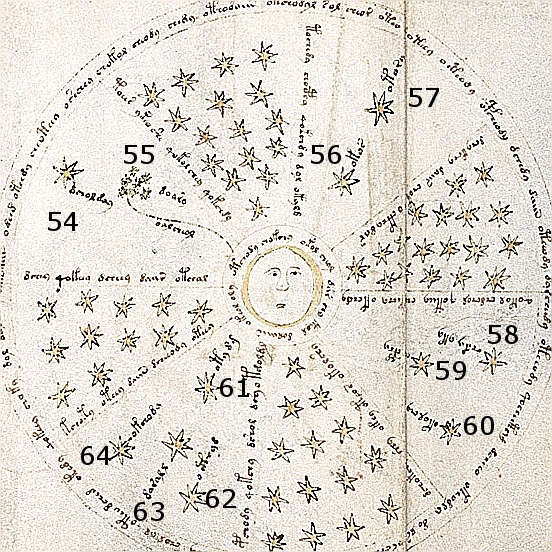 2) The 12 astrological houses have been synthesized in four quadrants, “numbered” clockwise by the number of stars indicating the direction of the apparent daily movement of the Sun starting at sunrise. Making these assumptions, the central cross of the diagram still roughly corresponds to the equinoxes and solstices. The vertical line corresponds to the equinoxes (the Sun at noon is at Medium Coeli and the day represented is the Vernal equinox). The horizontal line (the horizon) corresponds to the solstices. Mac Kenzie discusses a number of technical problems related to this point in Appendix A. Star #54 EVA:dcholday tyashtun could be Sirius – Tištar in the GB (in Cancer), also called Tishtrya, Tashter. It is the “chieftain of the east”, so its position at the ascendant is perfectly appropriate. 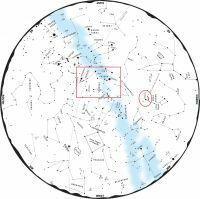 Tishtar is the only fixed star mentioned in the Horoscope of the World. Star #55 EVA:doary taurn could be the Pleiads (in Taurus). In the GB, the constellation is called gāw but other Persian texts have Tora (as in Eduljee’s diagram). It would be interesting to see later versions of this horoscope. From what I have read, it was widely copied through the centuries. The “tail” connecting the Pleiads to the Moon could correspond to the dragon of eclipse (whose head – caput draconis- is in Gemini, according to the horoscope). The GB describes this dragon as one of the enemies of Tishtar and of the other fixed stars. The Voynichese name of the dragon is closer to Arabic versions of the name (in particular “Jawzihr”) than to the original Persian Gochihr or Gozihr. Stephen already mentioned that the fifth element Akas / Akasha is connected to planet Jupiter. In the horoscope, Jupiter appears in the first quadrant, so I will propose here a couple of alternatives. a) “Akas” generically means “the sky”. Possibly this star is not a real star, but a label corresponding to “Medium Coeli” (the middle of the sky). b) EVA:okos is a cognate to other EVA labels (oko, okor, okol) that appear in f68r1 / f68r2 in the circles around the Moon and the Sun. As we discussed here, these words could mean “globe” or “luminary”. In this context, EVA:okos could mean “the Sun” (in Aries). Star #59 EVA:?cphy ?vn could be Vanand (Vega), the “chieftain of the West” (I think this could be the same star as #11, discussed by Derek here). Star #60 EVA:okolchy akashyn could be Nahazik, a Persian name of Capricorn that appears in some manuscripts of the Bundahishn. The initial ‘N’ was apparently dropped. Capricorn is particularly relevant because it is one of the four cardinal signs and in this horoscope it appears exactly at the West. Star #63: EVA:darall turushsh could be Tarāzūg, Persian for “Libra”. Libra also is a cardinal sign and occupies a cardinal position (North). In 3 of the labels discussed above, I matched EVA-l with “z” (JawZihr, NahaZik, TaraZug). I think that the Bundahishn horoscope of the world provides a meaningful context for the elements of the diagram analyzed by Stephen, with a few possible additions. All the labels discussed are Persian (or Arabic terms derived from Persian terms). The position of Tishtar is consistent with its role as “chieftain of the East”. The prominence of the “dragon of eclipse” and of the Moon is explained by the fact that the Zoroastrian cosmogony is strictly related with eclipses: the evil dragon trying to obscure the good luminaries. This also explains the similarity of f68r3 with the Spanish eclipse diagram we discussed a few weeks ago. Sorry, I found another mistake in my post: the discussion of Star#11 I linked about Quadrant 3 is by Derek, not Darren. The page is described as “Prophecy map of world to AD 1600-1606”. I have rotated the image in order to align it with Voynich f68r3 and with the labels on the page itself. The central cross seems to represent directions. The labels outside the circle, from the top clockwise: Oriens/East, Austro/South, Occidens/West, Aquilo/North. The arms of the cross are labeled with vices: Crudelitas (cruelty), Dolositas (deception), Calliditas (shrewdness), Mentita Deitas (false gods). Inside the circle, the names of the two prophets Elias and Enoch. I could not read the other labels. Possibly “Gog” is mentioned at the end of the wavy line near the center of the diagram. “Israhel” the second word in the small circle at the beginning of the wavy line? in the talk you gave last April, you suggested that Star #54 (EVA:dcholday / Tyashtun?) might be Tishtrya (generally identified with Sirius, less frequently with Aldebaran). In the same talk, you also suggested that Star #43 (EVA:dcheoldy /Tyoashtu?) might be the same star. This seems very likely to me. I initially thought that Star #54 might have been Aldebaran, but now I think that the identification with Sirius is more correct. In particular, if f68r2 corresponds to the Southern hemisphere, Sirius belongs there, while Aldebaran doesn’t. Considering f68r3, if we assume that the top left quadrant corresponds so Aries, Taurus and Gemini (as in the Spanish manuscript we recently discussed) Sirius belongs to this quadrant, since its right ascension corresponds to Gemini. I also think that Star #59 (EVA:?cphy ?vu? / ?vn?, according to Derek’s proposed phonetics) corresponds to Star #11 (EVA:cphocthy Vajn). Derek identified Star #11 as Vega. Vega’s right ascension corresponds to Sagittarius, the sign opposite to Gemini. So it makes sense that the two stars appear in opposite quadrants of f68r3. In Zoroastrianism, Tishtrya (Sirius) and Vanand (Vega) are the guardians of the East and of the West respectively. This suggests to me that Star #16 (EVA:ofcheor Afyoar? ), prominently placed at the center of f68r1 as noted by Derek, could be the guardian of the North (Ursa Major) that Zoroastrians call Haptoring/Haftoreng (Av. Haptoiringa). The page linked above also provides a few interesting ideas for the label of the wavy line connecting the Pleiades to the Moon in f68r3 (EVA:oalcheol aushyoash). Apparently, in Zoroastrianism, the Milky way is called Rah-i Kawosan (Path of Kayus) and in the corrupted form (Rah-e) Kah-Kashan, the (path of the) chaff-draggers. If I understand correctly, the Milky way was also sometimes identified with the dragon Gochihr (that was also seen as a comet or as the path between the lunar nodes -see the Latin Caput / Cauda Draconis). Seven chieftains of the planets have come unto the seven chieftains of the constellations, as the planet Mercury (Tir) unto Tishtar, the planet Mars (Warharan) unto Haptoring, the planet Jupiter (Ohrmazd) unto Vanand, the planet Venus (Anahid) unto Sataves, the planet Saturn (Kevan) unto the great one of the middle of the sky, Gochihr and the thievish (dujgun) Mushpar, provided with tails, unto the sun and moon and stars. Various new demons arise from the various new sins the creatures may commit, and are produced for such purposes; who make even those planets rush on which are in the celestial sphere, and they stand very numerously in the conflict. 44. Their ringleaders (kamarikan) are those seven planets, the head and tail of Gochihr, and Mushpar provided with a tail, which are ten. Gochihr stood in the middle of the sky, like a dragon, its Head in Gemini and Tail in Sagittarius, as there are always six constellations betwixt its Head and Tail; its motion is backward; every ten years, its tail returns there where is its head and its head returns there where is its tail. Possibly, f68r3 meant to represent this dragon: his head is in Taurus (next to Gemini) and it consists of the seven stars of the Pleiads (instead of the seven planets). His tail is “unto the moon”. Actually, I don’t think that the passage from Ch.28 meant to say that the seven planets are the head and tail of Gochihr, but it could have been interpreted in this way at some time (I also think of the seven headed beast of the Apocalypse). Accoding to ”The Dragon in Medieval East Christian and Islamic Art” by Sara Kuehn In Islamic astronomy the Persian gochihr, called “al-jawzahar”, possibly reasonably close to aushyoash? When others here were originally talking about pages like this one with the strange diagrams and possible maps and such, I didn’t comment because I was focused at the time on plants and 68r 1 & 2, but, now that I’ve come back to pages like this one to review them more closely, I believe the match between this Voynichese word and the dragon’s known names gets tighter with the phonetic system I’ve been using than it is with the one that’s used above. I have no problem with a letter being added at the end, but the dropped one at the beginning does bug me a bit. It’s easy to get false positives if you allow for things just entirely disappearing like that when it’s convenient. I know of no precedent for dropped initial /g/. But I’ve seen initial-consonant-dropping a few times before with /p/ or /f/ and possibly once with /b/, so this only requires that the pattern of dropped initial consonants is a bit wider in scope than I originally thought (although still not common and not giving me any sign of when to expect it). And six letters/sounds in a row is a very long match string to dismiss as coincidence, possibly the longest so far. What does this name Tištrya/Tištar/Tašter look like in the native alphabet, and what is its etymological origin? Hello Derek, this Encyclopaedia Iranica article is the best source I could find about the etymology of Tištar. I have found a XV Century Spanish manuscript (Tratado de astrología. Enrique de Aragón, Marqués de Villena) that I find interesting. 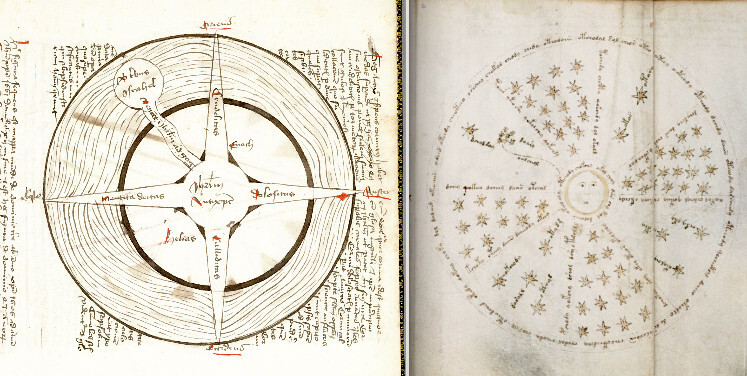 I have been looking for a while for parallels of Voynich “star maps” f68r1 and f68r2. The illustration at pg.88 has analogies with those Voynich pages: it is circular diagram illustrating the starred sky with a few star names and no constellation images. Unluckily, this Spanish diagram does not seem to be very accurate. The North star is indicated by the label on the left. The label on the right mentions the “other pole”. But the ecliptic with six zodiac signs runs from the left to the right, i.e. from the North pole to the South pole. This obviously does not make sense. The top of the globe has been marked “line of the ecliptic”: the ecliptic running between the top and the bottom of the diagram would be consistent with the positions indicated for the poles. I examined the very few star names that appear on the image: I count only six (including the above mentioned Polaris). I could read and make sense of only two of them: “Caprillas” (which could be “Capella” in the Auriga constellation) and “Astilez” (which could refer to Bootes, sometimes called “hastile” -the bearer of the staff- in Latin). In this diagram, Polaris, Capella and Bootes are roughly on a line in this order, while actually they are roughly on a line but with Polaris at the center (e.g. Capella, Polaris, Bootes). So I could not make sense of star names either. Things seem to be clearer with pg.75, which in my opinion parallels Voynich f68r3. This circular diagram is divided into four quarters. The Moon appears at the center. Each quarter corresponds to a different season. Each season is indicated by three zodiac signs (e.g. top right “quaterio de aries taur[us] ge[min]is”). 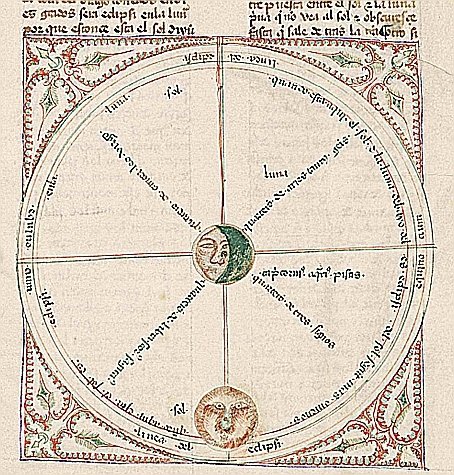 The Sun at the bottom is next to the label that marks the ecliptic (“linea del eclipsi”). Other sentences along the circle describe when and how eclipses occur. The horizontal diameter is marked “equinox” on both extremes. So the vertical line corresponds to the solstices. The structure of this diagram is consistent with what Jan M wrote on this site about f68r3: ”The star-filled slices are four. Some sky-related things are four too, such as seasons or major lunar phases. So the stellar features may be related to something of four categories, too. Such interpretation may lead to seasonal stars (or season-governing stars) and radial inscriptions may represent equinoxes, solstices, season changes and/or seasonal events”. Finally, I noticed that on pg.45 and pg.51 the Moon and the Sun appear at the center of a circular inscription. In both cases, the inscriptions mention the object displayed: “cuerpo del sol mayor que la terra”, “cuerpo de la luna” (I was not able to entirely understand the other words of the two inscriptions). 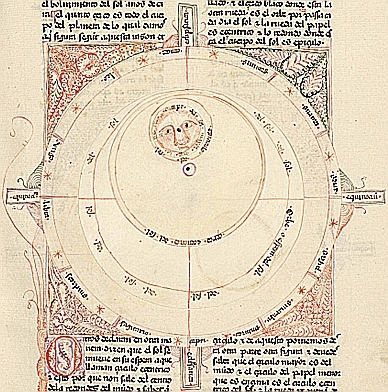 This suggests the rather obvious hypothesis that the Moon and the Sun could be mentioned in the corresponding circular inscriptions in f68r1, r2 and r3. 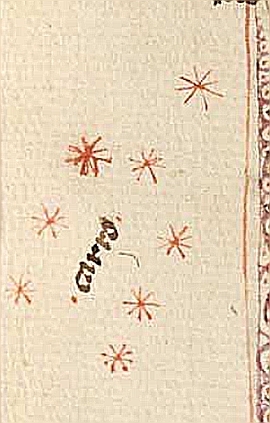 It is tempting to wonder if this has a parellel in the seven stars in Voynich f68r, but here they are in a bow or semi-circle, whereas the Voynich seven stars are clustered together. Altogether, one of the best Christmas presents I will get this year! 🙂 Thanks Marco. Hi Stephen, I don’t think the diagram on p43 has sth to do with winds. It just lists the cardinal directions. In the North (left) is the Nort star and an additional smaller one, which I couldn’t identify. Hi Johannes – It is definitely about winds – you can see the names ‘viento est’ and viento suest’ (East and SouthEast Wind) in the diagram, top left, and also in the text on the previous page is a fuller discussion of the winds. But I think it is also more than that – I will try to examine it more. I am glad you find the manuscript interesting! 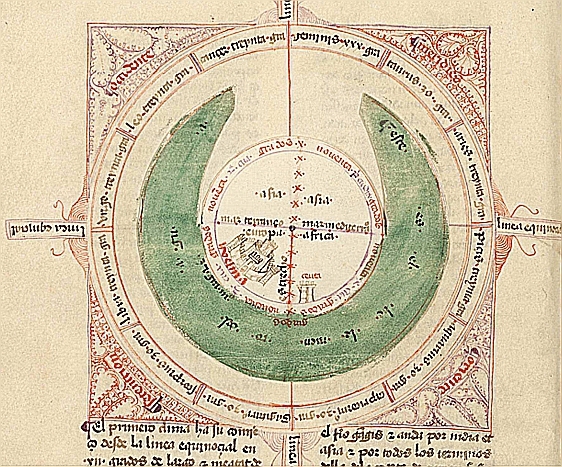 About p.43, I agree that the diagram clearly is a wind rose. In my opinion, the “carro” constellation is meant to represent the lesser wain, i.e. Ursa Minor. 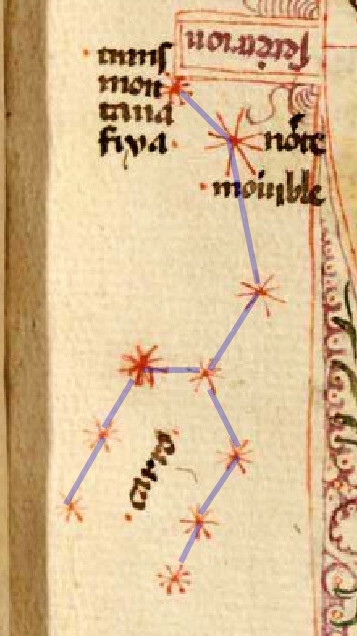 As pointed out by Johannes, the constellation includes the North Star (labeled “transmontana”). Anyway, it is a strange image of that constellation, since it includes ten stars, while according to Ptolemy they are only seven plus one “unformed” (i.e. lying outside the constellation). so maybe Ptolemy was referring only to the seven in the main ‘dipper’, plus the one above it. I think you’ll find that ‘carro’ is always Ursa Major, although in some cases people have argued that the Kabbalists were referring to U.minor and not U.major. In my opinion, this is very closely related to the Voynich. Although I’ve chosen not to make the post available to the public (to limit plagiarism, at least to the point where I can publish my own work without it seeming old hat), I do identify part of the west roundel as probably Ceuta. I’d say there’s a direct connection here, and well done you for discovering it! The nearest I’d come was the compendium created by Abraham Cresques for the court of France, and which is somewhat curiously known as the ‘Atlas Catala’ although it isn’t an Atlas and wasn’t made in Catalonia. Cheers – and congratulations again. Hi MarcoP. The diagram on p45 has sth to do with the movement of the sun’s path during the year. However, it is likely copied from (or possibly illustrated after) ancient source, as the solstice in the 1400-1500 must have already been in Gemini and not in Cancer as depicted. These diagrams appear to me more like aids to construction of various instruments rather than star-charts as such. The XIII Century French manuscript BAV Pal. Lat. 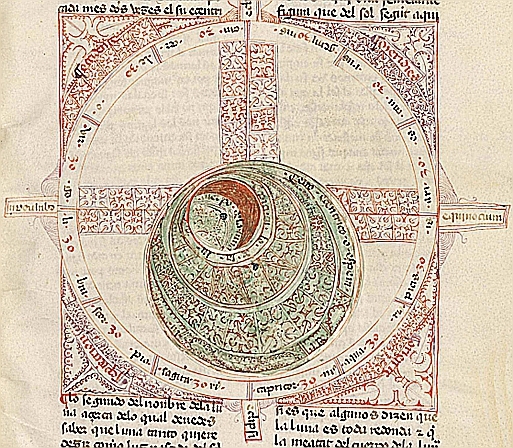 1400 contains an illustration representing a star globe with only stars (no constellation images). 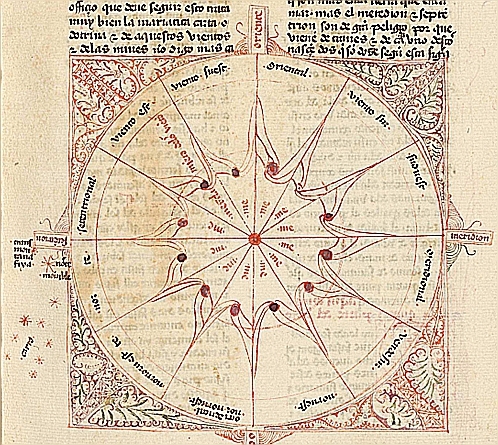 This is obviously similar to p.88 of Villena’s Tratado de astrología discussed above and is also somehow similar to the Voynich “star maps” f68r1/r2. The first page of Pal.Lat.1400 contains the “globe” as well as two ex-libris from the second half of the XV Century: it is possible that also the illustration dates to that period. I attach my tentative reading of the labels on the globe. If I understand correctly, only two stars are named: Sirius and Antares (the heart of the scorpion). “Alhabor” for Sirius is a Latin corruption and contraction of the Arabic al-‘abur al-Yamaniyyah. Both stars are represented in the Northern hemisphere (the half of the globe below the zodiac) but Sirius should be in the Southern. At the bottom of the zodiac “circle” there are a couple of words I cannot read. One of the two could correspond to “Sagittarius”, which should follow Scorpio. The horizontal line intersecting the zodiac in correspondence with the equinoxes (the first degree of Aries and Libra) is marked “[a]eq[i]noc[tium]”. a possible match for star #63 ‘Turushsh’ (EVA ‘darall’) could be the Persian “Tarazed” or “Tarazad” (gamma Aquilae). More or less the same word was also used as the name of the Libra zodiac constellation: “Tarazu”. This interpretation does not fit well with the idea that the four quadrants correspond to the four seasons: Libra (and Aquila) should be in the quadrant corresponding to Autumn, opposite to the Spring quadrant of Taurus. On the other hand, it does fit well with the hypothesis that Star #54 bears a Persian name of Aldebaran (“Taschter”).